Gupta's surprise August resignation can now be seen as the result of a year-long degradation of the relationship between the past president and the administration. By Moira Warburton · Jan. 28, 2016, 1:34 a.m. 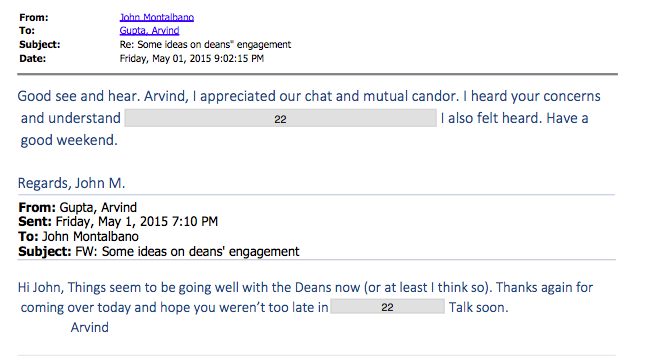 The timeline that led up to former President Arvind Gupta’s surprise resignation last August is becoming clearer, largely thanks to documents accidentally leaked by UBC and discovered by Reddit users late last night. The leaked documents were attachments to emails included in the freedom-of-information (FOI) package UBC released earlier this week. When reading the 861-page document as a PDF, the attachments are not active links, but when reading it in Adobe Reader the attachments are able to be downloaded — hence why most people missed them when first reading the FOI document. 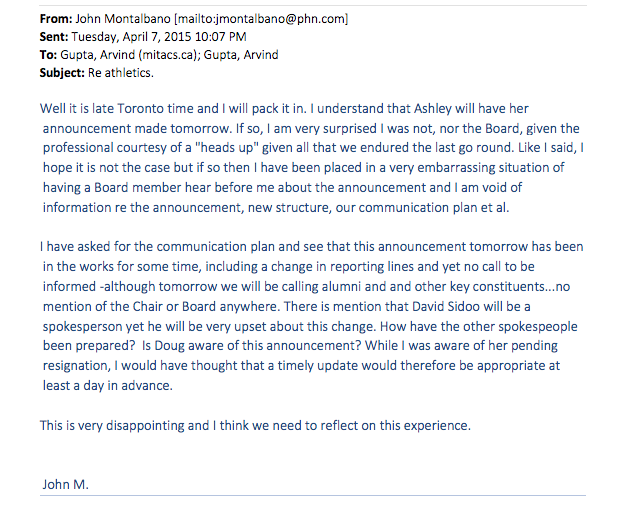 Through email correspondence intentionally included in the FOI package, it is clear that the relationship between John Montalbano, then-chair of the Board of Governors who resigned October 15, and Gupta started off as amicable. However this relationship deteriorated over the course of less than a year. The most notable leaked documents that demonstrate this are notes from a May 18 meeting with Gupta and the executive of the Board of Governors, and Gupta’s written response to this meeting. 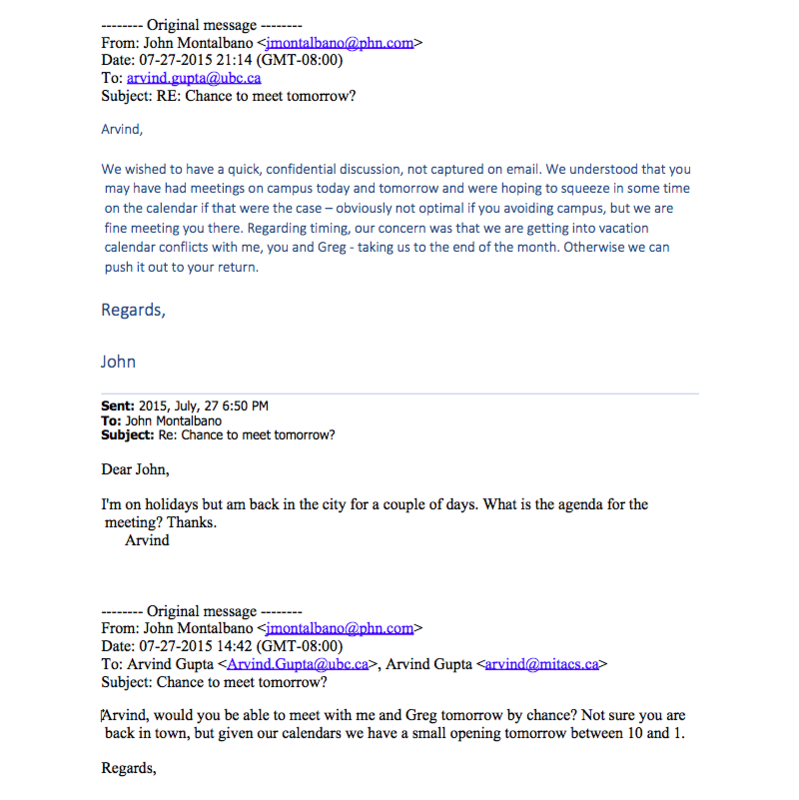 An email on May 14 from Montalbano to Gupta requests a meeting. 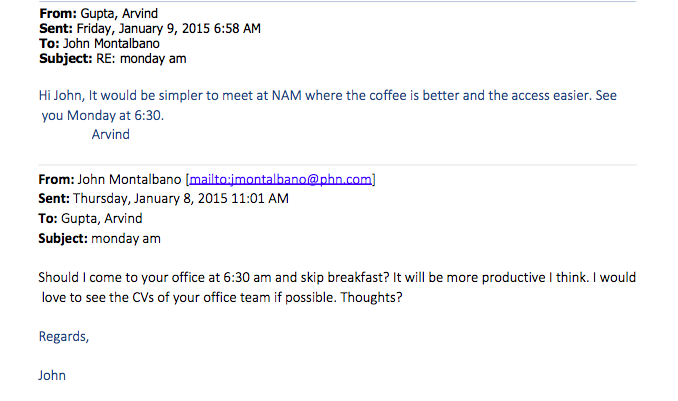 The note summarizing the meeting, written by Montalbano and included as an attachment in a later email, are scathing. For the university to thrive and move in tandem, it is also essential that there be no perceived gap between the Board and the President; any public perception of such a gap must be dealt with quickly. These “key aspects” numbered eight in total. Related: UBC loses a VP Finance, a VP Academic and a VP External, all in one year. The second was to create an environment of collegiality and collaboration, which was the “role of a leader,” according to the Board, and something that Gupta was not doing. The third point was to undertake a review of the President’s office. “The issue with the Deans in response to the Provost announcement was a catastrophic example that you are not either being informed in a timely manner or worse, the very people you are relying on are unable or currently not in a position to develop relationships of trust to provide you with the information you need prior to any major initiative.” It is unclear what the issue was. The board also had issues with communication coming from the President’s office and between Gupta and the executives. “While the communications are fact based, they are void of empathy, often not tied to University strategy and deemed to be hastily released without proper pre-consultation to prepare key stakeholders in advance,” the note said. As President and leader, issues such as low employee morale on campus, the relationship challenges with your key stakeholders and the simmering external reputational risks developing as a result of these challenges, are fully yours to own. The final two points were to bring about a timely search for a new provost and an increase in Gupta’s understanding of accountability, which Montalbano and the board found that Gupta seemed to severely lack. Understanding these issues sheds light on the emails that were released in the FOI package. 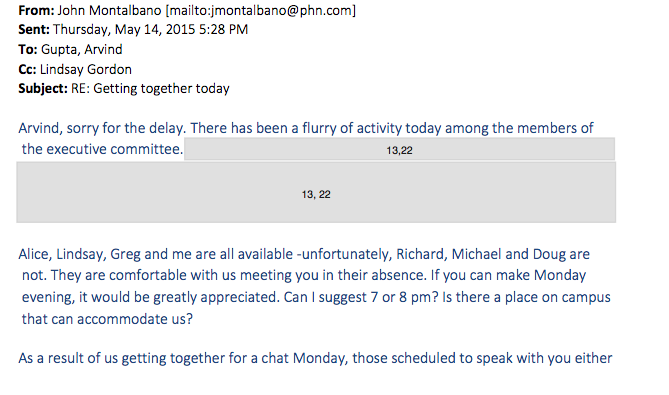 From October until July, emails organizing meetings between Montalbano and Gupta increased, often with other Board of Governor members present too — Peet, Laberge, Mitchell and Gordon were all mentioned in emails. The meetings featured honesty of an unknown degree on both sides of the table, as expressed in emails from that time. The relationship between Gupta and the Board of Governors, specifically Montalbano as its chair, started off as extremely amicable. In January, Montalbano expressed interest in looking at the resumés of Gupta’s staff. Knowing the issues the Board had with Gupta's office, this email becomes much more meaningful. In April, news of Ashley Howard, managing director of UBC Athletics, stepping down from her position broke. Montalbano sent a message to Gupta, clearly upset at the president’s handling of the situation. Emails become increasingly redacted as they move towards May. Then came the May 18 meeting, with its corresponding summarizing note outline above. Gupta responded to the May 18 meeting with a written letter of his own. He admitted his own leadership flaws — “No leader can succeed without listening, seeking advice, being receptive and engaging in positive reinforcement. On my own part, I will be engaging an executive coach to help enhance my leadership skills” — but also pointed to the decentralized nature of the university’s governance structure, which made lapses in communication inherent although he acknowledged the need to breach these. He also suggested UBC join the Association of Governing Boards, an organization dedicated to enhancing the relationship between the Board and the University Executive. “I believe that the experience and services offered by this organization can be helpful to us as we move forward,” wrote Gupta. The executive committee of the board responded with yet another letter, asking for specific details in how Gupta intended to approach each of the issues outlined. Presumably, the commitment to assist Gupta with the transition to president of a public institution — frequently expressed in all communications — was unsuccessful.